The SecurePCI Adapter is a great product!! No degradation in computer performance and is completely transparent. "I have been using two Secure PCI adapters for nine months now, and have not had a single issue with them. One is used in a workstation where fast disk access is essential, and I am pleased to say that I have not been able to notice any difference in performance between running with the Secure PCI adapter or running on an unencrypted drive. The second Secure PCI adapter is placed in a e-mail/web/file server which has been running non-stop for the last 9 months, except a few reboots to upgrade the kernel from time to time. I can highly recommend this product." The Enova® Secure PCI Adapter combines the power of strong encryption with unprecedent throughput to protect sensitive data and credentials stored on PCs and servers. 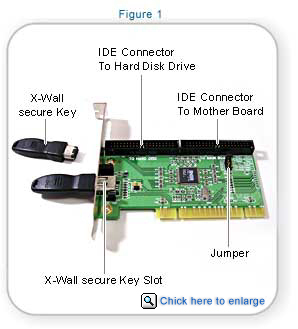 Once installed into an available PCI slot, the PCI Adapter automatically and transparently encrypts all data stored on the target hard drive. Enova®'s X-Wall solution completely eliminates the traditional trade-offs between speed, convenience and security. X-Wall performs automatic and transparent hardware based "real-time" encryption at an unprecedented 1.6 Gigabit per second, requiring no user intervention- This ensures users never experience any performance degradation, with systems functioning at exactly the same speed as before X-Wall was installed. The X-Wall Secure Key stores and protects the encryption key used by the X-Wall microchip to encrypt data. The correct X-Wall Secure Key must be inserted into the special key socket (present on X-Wall finished products) at system boot up to authenticate the user and authorize the operating system to load before granting access to data stored on the hard drive. X-Wall provides the complete security your data deserves. Utilizing only Government NIST approved DES (Data Encryption Standard) and TDES algorithms for assured security, X-Wall also allows you to choose the encryption key strength that best suits your particular requirements. Please refer to the Figure 1. 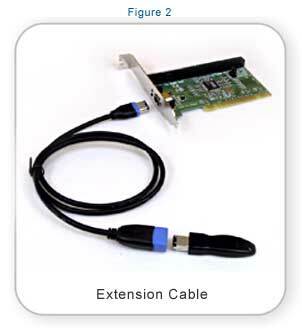 The installation of the Enova® Secure PCI Adapter is a snap. Find an available PCI slot. Connect your hard disk to the IDE connector labeled as "To Hard Disk". Connect the other IDE cable to the IDE connector labeled as "To Mother Board." Of course, you must determine the Master/Slave mode of your hard drive then adjust Jumper setting on the Secure PCI Adapter accordingly. The Enova® Secure PCI Adapter uses only power, ground and frame support from the PCI slot, thus the device driver isn't required. We supply you the extension cord to avoid bending your knees. As illustrated in Figure 2, you must connect the other end of the extension cord to the Enova® Secure PCI Adapter key insert. You may remove the key token after the X-Walled drive has been properly recognized by your system.